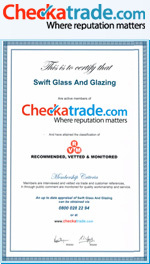 Swift Glass and Glazing work to the highest standards of practice and are committed to offering a first class service for our clients. We specialise in double glazing repairs, replacing sealed misted units, window repairs and provide a full range of glazing services in Guildford, Aldershot, Alton, Woking, Farnborough, Farnham, Godalming and throughout Hampshire, Surrey, East and West Sussex and the South West of London. With over 25 years experience, we have the expertise to accept any job, no matter how small, from a picture frame or compact mirror, to a large glass shop-front or glazed roof. Traditional glazing is a cornerstone of our business, from Georgian windows and leaded lights to sash and metal crittall windows. All can be repaired using traditional techniques and materials. We can replace broken or misted up double glazed units, offering a service for like for like replacements, or being able to upgrade just the glazing to modern energy saving double glazed units, without the high costs involved with changing your existing frames. Putting the customer first has always been a priority and we always keep you up to date with how your order is progressing. We can offer a delivery service if required for larger and more awkward items. All estimates are given free of charge and with no obligation. Worked solid all day and done an excellent job, could not fault the work or polite, friendly manner. We have recommended him to 2 friends and booked him to replace our porch glass roof. Small piece of glass in leaded light and new window hinges. Nothing was too much trouble for Kevin. The quality of workmanship was second to none even on very awkward 500 year old leaded lights. He was very prompt and very tidy. I would have no hesitation in recommending Kevin. It's so nice to find someone willing to come out even for the smallest job. Very happy indeed. Cat flap fitted into a new double glazed panel. Thoroughly impressed with the work. The new panel was supplied and fitted within a week. I would definitely use them again in the future. 13 double glazing units replaced. Kevin was excellent in all aspects of the job and I would have no hesitation in recommending him strongly. Cat flap fitted into new French window panel. Kevin was great, came round to quote, made some suggestions, was very knowledgeable and gave confidence. The work was done to a high standard, and he left everything neat and tidy and made sure we were happy! Would definitely recommend. Quick and good quality finish. Replaced misted double glazed units in kitchen window and patio door. Very pleased with quote and care taken of units that were fitted and old ones that were removed safely taken away left all sparkling clean and tidy no mess. Well recommended. Thank you. New glass panel with cat flap inserted. Excellent job, very nice guy too. I would recommend.